New Chromebook has 360-degree convertible design that keeps touch display sturdy in four usage modes; Two USB 3.1 Type-C ports for fast data transfer, charging, display output. The new convertible Acer Chromebook Spin 11 provides all-day battery life, two USB 3.1 Type C ports, Google Play support, the latest Intel processors and can be used in four versatile usage modes. The Acer Chromebook Spin 11 continues in the tradition of the Chromebook R 11, which won many awards for design, performance and strong feature set, and now includes the latest ports, all-day battery life and solid performance in a stylish, convertible design. Acer has announced its new Acer Chromebook Spin 11 (CP311-1H/CP311-1HN) at The Bett Show in London. Designed for families, students and individuals who want to embrace the ease and security of Chrome, the new convertible Acer Chromebook Spin 11 features a stylish design that can be used in four versatile usage modes. It also features all-day battery life and two USB 3.1 Type C ports for charging and connectivity to external displays. In addition, the new Acer Chromebook Spin 11 (CP311-1H/CP311-1HN) fully supports Google Play and maximizes the functionality of the device’s 11.6-inch touchscreen display with stylus input. The optional stylus powered by Wacom® EMR (Electro-Magnetic Resonance) technology(2) can be used with the Chromebook to provide an excellent digital writing experience that mimics actual pen and paper. Acer will be at the BETT show from January 24 to 27 at booth B100, where units of the new Acer Chromebook Spin 11 (CP311-1H/CP311-1HN) will be on display. The new design of the Acer Chromebook Spin 11 features a sleek silver cross-hairline pattern on the top cover. This unique silky texture provides a premium look and feel that’s ideal for any environment. The new Acer Chromebook Spin 11’s 360° convertible design ensures users can enjoy an optimized touch experience on the 11.6-inch HD IPS display with 1366x768 resolution. After using the keyboard for input in traditional notebook mode, customers can open the touchscreen to a full 360° until it becomes a tablet. Plus, customers can stand it up in display mode to get closer to the screen, or use it in tent-mode for small spaces. The Acer HD webcam located above the keyboard has a wide field of view – so it’s great for including groups in video conferences and Google Hangouts. The optional second webcam is placed on the cover, so customers can conveniently capture images and videos of their surroundings when in tablet mode. Stay Connected to Peripherals, Wirelessly. The new Acer Chromebook Spin 11 includes two USB 3.1 Type-C Gen 1 ports, which can be used to charge the device as well as other products, transfer data quickly up to 5Gbps, and connect to an HD display to share visuals. The Acer Chromebook Spin 11 also includes two USB 3.0 ports and a MicroSD card reader to access and transfer content. Customers can stay connected to their network thanks to fast and reliable 2x2 MIMO 802.11ac Wi-Fi, and can connect to peripherals via Bluetooth 4.2. 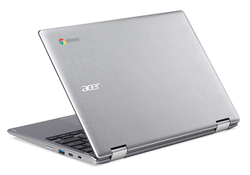 Processor options on the Acer Chromebook Spin 11 include the Intel® Pentium® quad-core processor N4200, Intel® Celeron® quad-core processor N3450, or an Intel® Celeron® dual-core processor N3350. It also comes with 4GB or 8GB LPDDR4 memory and either 32GB or 64GB on–board eMMC storage. The Chromebook Spin 11 is easy to transport in a book bag or backpack. It weighs only 1.25kg (2.75 pounds) and measures 296 (W) x 206 (D) x 19.95 (H) mm [11.65 (W) x 8.11 (D) x 0.78 (H) inches]. The optional Wacom EMR stylus allows customers to sketch, take notes, capture ideas, as well as interact with programs and apps with precision. The Wacom EMR stylus provides a natural writing experience that resembles using pen and paper. Plus, it doesn’t require a battery and is resistant to accidental drops. The Wacom EMR stylus will come standard on Acer Chromebook Spin 11 CP311-1HN configurations. Chromebooks are easy to use and share by multiple users. Customers simply log into their own Google account to access their Gmail, Google Docs, apps, extensions, bookmarks and other information. Chromebooks run on Google’s Chrome OS platform, which provides automatic updates and multiple levels of security to guard users against ever-changing online threats. Many Chromebook customers store their files on Google Drive(3) which protects files, documents, and photos safely in the cloud, and ensures that the most current version of the file or document is always available and safe, even if the Chromebook is lost or stolen. Several models in the Acer Chromebook Spin 11 line (CP311-1H/CP311-1HN) will be available in North America in March with prices starting at US$349 and in EMEA in April with prices starting at €379. 1.) Battery life is based on Google power_LoadTest for non-touch model (http://www.chromium.org/chromium-os/testing/power-testing). Actual battery life varies by model, configuration, applications, power management settings, operating conditions, and utilized features.